Dr. Osman is the Program Director of the Division of Nuclear Medicine, Department of Radiology, Saint Louis University Hospital, St. Louis, MO. Today, more than ever, doctors are transforming patient care through the early detection and diagnosis of disease, giving patients a greater chance of survival. Much of this early detection is achieved through medical imaging technology. One imaging technology that is gaining more widespread use is the combination of single photon emission computed tomography (SPECT) and computed tomography (CT). In the nuclear medicine division at Saint Louis University School of Medicine, Saint Louis, MO, 50% of the patients referred for a nuclear medicine study receive a SPECT/CT exam. The majority are scanned for metastatic bone disease, pheochromocytoma, neuroblastoma, and cardiac imaging, and the remaining for musculoskeletal, hepatobiliary, renal, and neurological conditions. 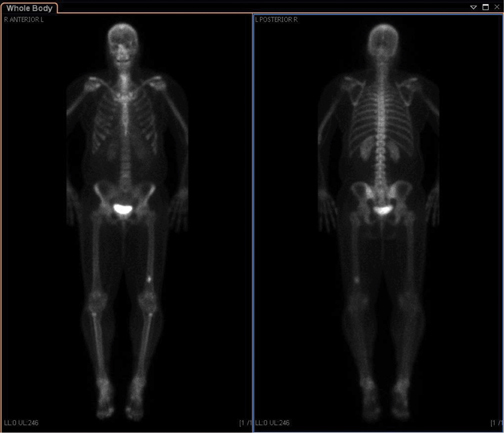 With the recent installation of the BrightView XCT SPECT/CT system by Philips Healthcare, doctors at Saint Louis University School of Medicine are effectively changing patient management, while lowering the radiation dose in some cases and increasing the speed of image acquisition and reporting in others. Hybrid SPECT/CT imaging has been instrumental in overcoming some of the inherent shortcomings of SPECT imaging, in particular the lack of anatomic localization. While SPECT gave us tomographic information and higher sensitivity than planar, you still had challenges with localization of lesions because there still wasn’t the detailed anatomy from the CT. Some hybrid SPECT/CT systems combine SPECT cameras with conventional diagnostic CT systems. While these dual-gantry systems resolve the localization challenges, they also introduce additional complexities of their own. Although the addition of the CT addressed these challenges by adding the anatomy and the localization of lesions, it brought with it its own challenges, including a larger footprint, increased radiation dose, and more training for the technologists and physicians. The radiation from the CT was also an important consideration in pediatric patients. The unique design of the BrightView XCT system overcomes many of these obstacles. This hybrid imaging system integrates a full featured variable angle gamma camera with a flat-panel cone-beam CT component used for localization and attenuation correction of the SPECT data. The flat-panel CT component is mounted on the same rotatable gantry as the SPECT detectors. This coplanar configuration reduces room size requirements and system weight compared to hybrid systems using spatially separated SPECT and CT gantries. Furthermore, it reduces the amount of table translation required between the SPECT and CT imaging position. The-flat panel localization images are acquired with a fraction of the dose compared to a diagnostic CT exam, using less power to operate and without requiring any additional dose for a scout or topogram image that conventional CT scanners require. Furthermore, the high-resolution flat panel detector enables true isotropic voxels, which means that image resolution is maintained when the data are viewed from any angle. This is particularly important in the context of SPECT/CT imaging, since SPECT data also have isotropic voxels and are routinely reviewed in transverse, sagittal and coronal views. A costly problem for hospitals when acquiring a new system is retrofitting an existing floor plan, which can be prohibitively expensive. However, BrightView XCT’s footprint is compact and fits into rooms as small as 15´ 6˝ × 11´ 7˝ (4.72 meters × 3.53 meters) with minimal shielding, and, in most cases, there is no need to reinforce flooring. The BrightView XCT was a solution that made everyone happy—the hospital and physicians. It gave us the same footprint as the dedicated SPECT camera, so we didn’t have to build out a larger room. Since the system was designed entirely for nuclear medicine, the learning curve on the technology was not as steep as with other SPECT/CT scanners, and training the staff did not pose any significant concerns. We were able to overcome a lot of the limitations of SPECT/CT when we installed the BrightView XCT, and we promoted this fact to our referral network. Concurrent imaging and the ability to acquire high-resolution CT images are two features of BrightView XCT that have helped to stimulate a renewed interest in musculoskeletal (MSK) imaging. Concurrent imaging, which allows the user to create multiple datasets from a single acquisition step, offers more flexibility in acquisition protocols and provides additional information without requiring additional imaging time. One way to make use of concurrent imaging is in dual isotope studies. A classic example is with infection imaging in the musculoskeletal system, and with one day for the indium and one day for the bone scan. Now we can do a simultaneous acquisition for the indium and the bone scan without worrying about patient repositioning or additional image acquisitions in a single day. That is a very unique feature that is available now on the XCT. The high-resolution imaging capabilities of the BrightView XCT system have also proved useful for MSK imaging, especially when imaging of the extremities is involved. The high-resolution acquisition on the new system has come in handy by giving us a niche in musculoskeletal imaging. 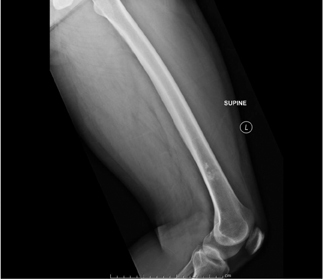 The MSK applications brought life to bone scanning. We can now produce information and give our referring physicians images that have a 0.33-mm resolution of the foot or hand where they suspect a tumor or an infection. This is compared to studies we had where magnetic resonance imaging (MRI) and x-rays were negative, the bone scan planar was negative, and even the SPECT was questionable, until we did the bone examination at high-resolution image acquisition, which showed the abnormality with high certainty. This enabled us to provide information to referring physicians that we would otherwise not be able to do. In a recent case, a 46-year-old female presented with a history of hepatic adenoma and persistent elevated alkaline phosphatase since October 2011. There had been no history of previous fracture or trauma. 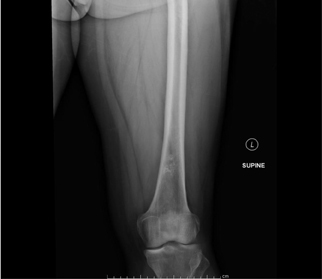 A whole-body planar bone scan (Figure 1) with focal uptake in the left distal femur indicated the differential diagnosis involved benign and malignant conditions. The limited uptake of the upper-thigh SPECT/CT (Figure 2) revealed the uptake to be within the bone marrow. The differential diagnosis involved benign and malignant lesions. Yet, a high-resolution SPECT/CT of the left distal femur (Figure 3) showed stippled calcifications within the distal femoral intramedullary cavity without additional aggressive features most consistent with an enchondroma. Given the information already provided by the high-resolution SPECT/CT examination acquired on the BrightView XCT, the x-ray (Figure 4) or any additional radiologic evaluation would not be needed. Patient management has subsequently changed by reducing the need for follow-up exams, such as MRI, or further evaluation because we now can provide functional and anatomical information without additional image acquisition. This not only reduces cost to the healthcare system and additional cost to the patient, but also speeds up throughput because there is no lag in time between exam 1 and exam 2. 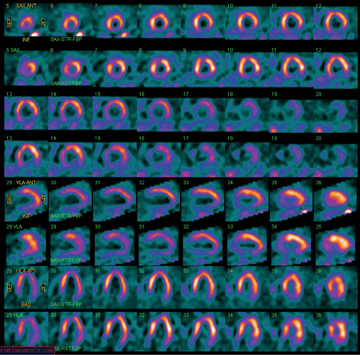 The American Society of Nuclear Cardiology and the Society of Nuclear Medicine have jointly recommended the use of attenuation correction in addition to ECG gating for SPECT myocardial perfusion studies.8 Attenuation in cardiac studies has always been a challenge, but the BrightView XCT is well-suited to attenuation correction for cardiac imaging. The flat-panel CT acquires a low-dose (0.12 mSv) CT image of the entire heart volume in just one 60-second rotation while the patient is breathing normally. 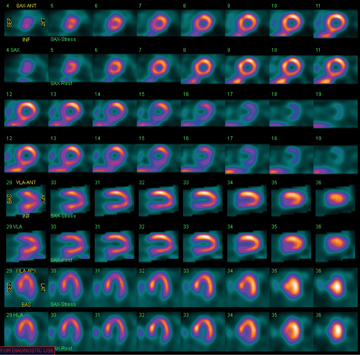 In this way, the data used for attenuation correction is averaged over multiple respiratory cycles to match the position of the heart during the SPECT acquisition. BrightView XCT also supports the Astonish reconstruction technology, which can process half-count data without compromising image quality. This gives the nuclear physician the option of improving laboratory efficiency by reducing the acquisition time using conventional dosing protocols or reducing the patient radiation dose by injecting less radioactivity and using more conventional acquisition times. The ability to take advantage of the cardiac application has allowed us to reduce the acquisition time by half or cut the injection by half, depending on the patient population (Figure 5). If you do stress-only, you can get the answer in <1 hour instead of the 4 hours it typically takes, with one less injection, and reducing the radiation dose by 30% to 40%. Now with the SPECT/CT, we can do stress-only images, and if the stress is negative, then we don’t need to do any rest-only images. If 50% of the studies are negative, then we can take advantage of stress-only, which helps with faster image acquisition and faster transfer of information to the referring physician, as well as decreasing the radiation dose to the patient. In many cases, cardiologists need a quick answer because they are contemplating taking the patient to the cardiac cath lab. The half-time acquisition with the stress-only imaging is critical because it provides the information at a much faster rate and has the potential to significantly improve operational efficiency without sacrificing accuracy because of the CT attenuation correction. The hospital’s referring physicians acknowledged the improvement in cardiovascular studies, and the half dose is especially beneficial in pediatric patients who, by definition, are more sensitive to exposure to radiation. The referring physicians are happy that we are scanning them at faster speeds or half the radiation dose to the patient. Another important consideration is patient comfort, especially on SPECT/CT, where patients spend significantly longer times compared to dedicated CT or x-ray. The more comfortable the patient, the less movement there is likely to be and the fewer image artifacts. 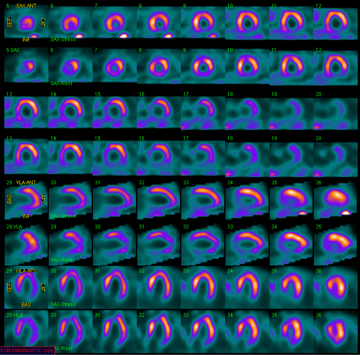 This is hugely important in cardiac imaging, where motion between the SPECT and CT image can cause misalignment between the transmission and emission data, which can lead to artifacts in the attenuation-corrected SPECT image. Controlling patient movement is also important in oncology, where accurate alignment of the two image sets is critical for localizing the SPECT uptake to the anatomy visualized in the CT image. Being able to position patients reproducibly is also important for patients who may undergo several exams over the course of their treatment. The exact positioning of these patients and alignment of lesions over a series of scans allows the physician to more accurately evaluate the response to therapy. The BrightView XCT is designed with a large gantry aperture that provides an open patient experience during the CT scans. This provides additional comfort for all patients, especially those with a high body-mass index (BMI) or those suffering from claustrophobia. The 500-lbs (227 kg) capacity of the patient table also facilitates imaging high BMI patients. The large bore enables us to acquire SPECT/CT images for patients with high BMI and not have to resort to planar acquisition. 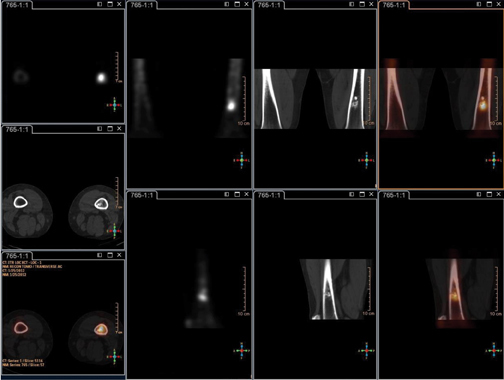 Advances in BrightView XCT have made significant strides in low-dose, high-resolution imaging. But it is only the beginning. We foresee doctors pushing to get more with less radiation and faster scan times. We also foresee a demand for dual-tracer image acquisition techniques. We were able to overcome a lot of the limitations of SPECT when we installed the BrightView XCT system, and we anticipate there will be a push for more types of simultaneous acquisition imaging. The key advantages of BrightView XCT include unique features, such as the large bore for bariatric patients, improved reporting speed and accuracy, minimal training required for technologists, the small footprint for ease of installation, and lower overall cost. Yet what is truly transforming the quality of care is improved image quality, reduced dose and shorter scan times, which we expect will lead to better overall care. Early detection plan. National Breast Cancer Foundation. http://www.nationalbreastcancer.org/edp/. Accessed August 24, 2012. SEER Stat Fact Sheets: Prostate. National Cancer Institute’s Surveillance, Epidemiology, and End Results (SEER). Lung Cancer (Non-Small Cell). American Cancer Society. http://www.cancer.org/Cancer/LungCancer-Non-SmallCell/DetailedGuide/non-small-cell-lung-cancer-survival-rates. Last Revised on February 17, 2012. Accessed August 24, 2012. American Cancer Society: Cancer Facts and Figures 2012. Atlanta, Ga: American Cancer Society, 2012. Last accessed January 6, 2012. Bockisch A, Freudenberg LS, Schmidt D, et al. 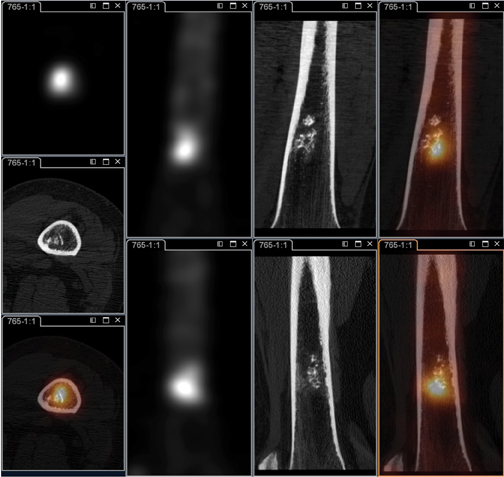 Hybrid imaging by SPECT/CT and PET/CT: Proven outcomes in cancer imaging. Semin Nucl Med. 2009;39:276-289. Rozovsky K, Kolewitz BZ, Krausz Y, et al. Added value of SPECT/CT for correlation of MIBG scintigraphy and diagnostic CT in neuroblastoma and pheochromocytoma. AJR Am J Roentgenol. 2008;190:1085-1090. Stoffels I, Boy C, Pöppel T, Kuhn J, Klötgen K, Dissemond J, Schadendorf D, Klode J, et al. Association between sentinel lymph node excision with or without preoperative SPECT/CT and metastatic node detection and disease-free survival in melanoma. JAMA. 2012;308:1007-1014. Heller GV, Links J, Bateman TM, et al. American Society of Nuclear Cardiology and Society of Nuclear Medicine joint position statement: Attenuation correction of myocardial perfusion SPECT. J Nucl Cardiol. 2004;11:229-230. Duvall WL, Wijetung MN, Klein TM. 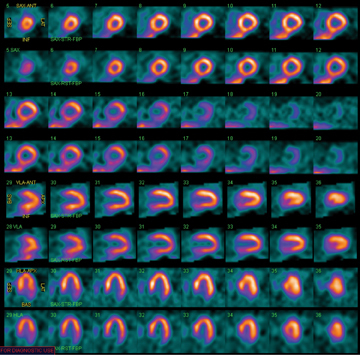 Stress-only Tc-99m myocardial perfusion imaging in an emergency department chest pain unit. J Emerg Med. 2012:42:642-650. Epub 2011 Aug 27. Low-dose, high-quality SPECT-CT imaging transforms patient care. Appl Radiol.